Many of Picasso's works produced during the later 1950s show views through a window or out over a balcony. Some of these may have been inspired by the actual layout of the studio at La Californie. However, these balcony views also recalled the work of Henri Matisse, who had been both a friend and a rival to Picosso for over half a century. The death of Matisse in 1954 hod a profound effect upon Picasso. Indeed the balcony views can be read as a homage to the older artist. 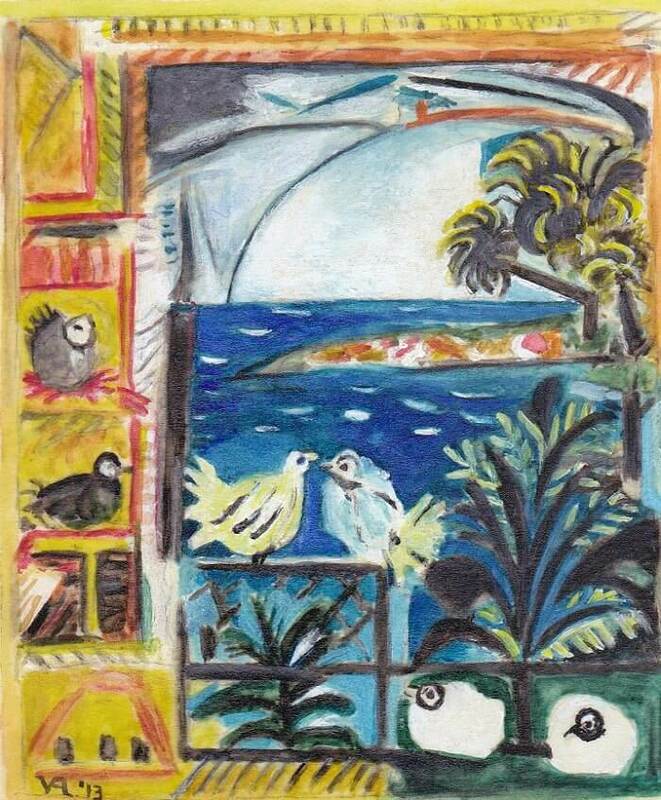 At the same time, the emphasis here upon pigeons recalls Picasso's father, the great painter of pigeons, as well as the recent success of Picasso's dove lithographs produced for the Communist Party, Here the view out through a window overlooking the bay at Cannes shows peaceful blue waters and a small island, or outcrop, gently breaking the stillness of the sea, Picasso has brought together the private world of the interior with the public world of the exterior, linking both in an image of reverie and nostalgia.